American Standard vs. American Series? Discussion in 'Guitars in General' started by ZosoRush, Dec 6, 2016. Hey all, is there a difference between the two? Im about to but an 07 American Series Strat and i was wondering if its the same thing and it was just a typo? Here's a few of the differences... imho, one isn't better than the other, just different.. So same pickups and hardware? No tonal difference? The American Standard became the American Series (~1998-2007), the Highway 1 became the American Special, then the American Series became the American Standard again (2008-2016), now it is called the American Professional(2017). Why Fender keeps changing it is beyond me. The American Standard should be the American Standard. 65DuoSonic, Average Joe and massacre like this. The standards (2008 to present) got the vintage-style bent saddles. I think there were a couple other minor changes, but can't recall what they were. From 2008 to 2012 the American Standards sold for $999 new. So same pickups and stuff or just save to grab an american standard? Well the bridge is completely different, Series has block saddles and Standard bent steel saddles. Bridge block on the Stsndard is supposedly higher mass copper infused. 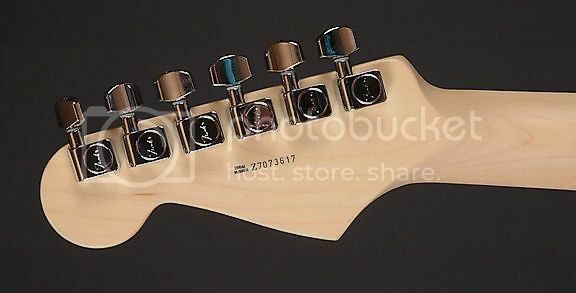 I know the Standard has staggered tuners with one string tree, don't know about the Series. I also think the pickups are different from 2008-2011 but not sure of that, in 2012 the Standard got Custom Shop Fat 50s pickups. So there're the "same" guitar just the name changed throughout the years because Fender is a troll. The model evolved over time. The first time, when the Standard became the American or American Series, they put staggered post tuners on it, improved the truss rod, finished the neck nicer, revoiced the A5 pickups a little, stopped using sandwich style bodies with big swimming pool routs and a few more things. When on Dec 31, 2007 the American (series) gave way to the newly introduced "American Standard" they changed the saddles from offset blocks to centered bent steels, fussed a little with the block, improved the finish and put an end to the seams showing on the bodies, replaced some of the glossy surfaces with matte, revoiced the pickups again and a few additional things. In 2012 they replaced the A5 pickups with these fatter ones, and now the model gives way to another Improved model. Fender is not a troll. They just are slow about realizing an American Standard is a good name only for a toilet. The American series never had (a 5 nor) a 6 screw bridge - that would be Highways and American Specials. Ditto on the non staggered posts - by about 2000 those were gone from the old American Standard nee American Series. Play a couple versions. Some people (like me) prefer the A5s. rich815, texrun38 and massacre like this. The revision called the "American Series" came out at the Summer 2000 NAMM show in July - the Summer show had only recently returned after many years of them only doing the Winter show, and in was in Nashville so I'm sure FMIC got a kick out of doing a big introduction in Gibson's home town. At any rate that's when they start rolling the fingerboard edges (i.e. the nicer finishing), they also restored 50s-style rounder body contours as the original run American Standards were kind of blockier. They switched to the HSH routing (although Fender had actually dumped the veneered bodies and swimming pool routing for the last 12-18 months of the original run American Standards). Also they somewhat staggered the polepieces on the A5 pickups to what they were calling a "modern stagger" - not as staggered as a vintage pickup. The original American Standard pickups were flat polepiece. Fender's marketing said their reason for dropping the "Standard" was that they "had made so many changes they hated to call it "Standard" anymore". The next major update was for 2008 when the name "American Standard" returns; this one Boris reversed in that they changed from all-satin finish necks to using glossy finish on the headstocks and on the fingerboards for the maple-board versions. All the other changes are as he stated. In March of 2012 they do the pickup change to the Custom Shop Fat 50s on the Strats; Teles not only got a CS pickup set but they also got back contour. The 2017 American Professionals are going to see new pickups, a new fuller neck profile (based on the one I played they will likely be thicker as wall as a fuller shape half-way between a C and a U), new tall/narrow frets, and removal of that no-load tone pot they have been using since circa 1997. The single-coil Tele is losing the back contour and gaining a modernized vintage bridge (steel plate with a small lip; the lip is taller back around the saddles, and 3 compensated-style brass saddles - supposedly even a small ashtray cover), and they are bringing back a Tele Deluxe model with 2 humbuckers, large pickguard and the LP-style controls - a modernized version of the 70s model - which will have the back contour. Now there is one thing to point out here - the 2008-spec American Standards were in production at the end of 2007 so they could fill orders placed at the January 2008 NAMM show; the first batches of them carry "Z7xxxxxx"/2007 serial numbers. Basically if the one you're looking at has the bent steel saddles on the bridge then it is the 2008 spec American Standard; if it has the satin-finish cast saddles then it is the 2000-2007 spec American Series. I believe around 2012, the American Std body also started getting a thinner poly finish. That was part of the 2008 update; the 2012 update was the pickups, the plastic changed to a more "aged" looking color, and they shuffled in some different paint colors. Well the one I'm getting has he bent steel saddles and 2 point bridge. Unless there's something odd going on (like the owner replaced the saddles or something) then it should be a 2008-spec American Standard even though it has a 2007 serial number. A couple of other quick things to look for - a 2008-spec will have a glossy-finished headstock, and if it has a maple fingerboard that will have a glossy finish as well (just the fingerboard; the back will have the satin finish). A 2007 American Series would have a satin finish on the entire neck (back, headstock, and fingerboard for the maple board models). This is the guitar I bought if it helps. Fender and Gibson are caught in this rather messy situation where we, the consumer market, are all about the glory of "vintage" models, vintage specs, the mystique of the "authentic Fender as Leo intended it" and other bs that comes with it. But if Fender were to make the exact same guitar models year after year, with no changes at all whatsoever, consumers of today (again: us) who are mentally conditioned to anxiously await the "new and improved" "next version" etc. to "hit the shelves" would at some point stop buying their guitars, because the majority of us don't need identical duplicates. As a result they would go under water in no time and would be replaced by other quality makers that do the "new thing" well, like Ibanez and others. On the other hand, they make a small change to some of their traditional specs, and we all go crazy: "boo two-point bridge on strats", "boo six saddles on a tele bridge" , "boo to the headstock truss adjustment", "boo to the non-nitro finishes" etc, etc,. This place has thousands of threads that bash modernized features of Fender and Gibson guitars, with many being active right now. 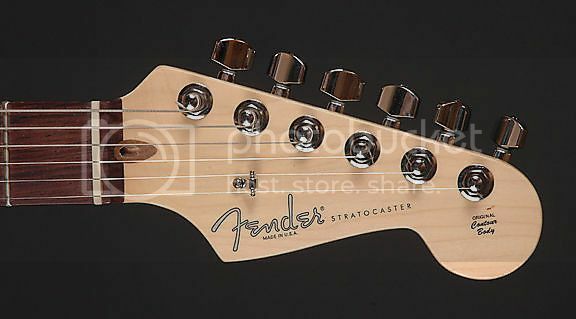 Fender's solution: keep things pretty much the same, but change insignificant features like staggered tuners, dot inlay material, a few tenths of millimeter more or less wood on of off neck profile, and change the name! Booooooom "Professional Series"! I was really hoping for them to follow up with the "Amateur Series" so I can be all cool and hip by playing a nonprofessional instrument that bloooz dentists avoid, but I guess I'll be left out this time around. Seriously though, its just their way of navigating through this very narrow space they are left with between our desire for "vintage" on one hand, and need to invent "new and improved" features on their otherwise same thing they have been making for decades. MickeyJi, Synex7254 and ZosoRush like this.